As the largest and most sophisticated studio complex outside of Hollywood, Steiner Studios offers ten soundstages – including the largest (27,000 square feet) on the East Coast – ample office and support space, and abundant on-site parking. 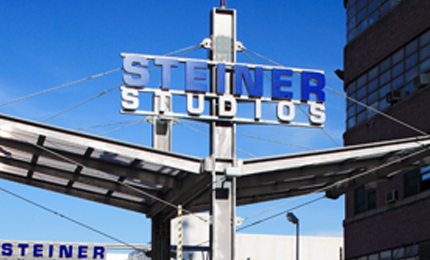 To meet the ongoing demand for production facilities in New York, Steiner Studios opened a new five soundstage complex, totaling 45,000 square feet, in March of 2012. The five new soundstages feature two or three wall cycloramas, silent HVAC, full pipe girds and adjoining support spaces. The new stages substantially increase the number of jobs in the film, television and commercial production industry in New York City. The historic renovation of the 7-story, 225,000 square foot building at 25 Washington Avenue was completed in November 2013 and contains additional support space such as mill shops, wardrobe suites, storage space and production offices. Steiner Studios is located within the Brooklyn Navy Yard, situated along the East River and flanked by the Williamsburg Bridge to the north and the Brooklyn and Manhattan Bridges to the south. The Brooklyn Navy Yard offers beautiful and unique vistas of the Manhattan skyline, the nearby bridges and an active waterfront. Founded in 1801, the Navy Yard also comprises a rich, historic back-lot, with buildings preserved from the Civil War, World War I and World War II, and an open campus environment with winding drives, expansive fields and abundant landscaping.